The photograph above originally appeared in the rotogravure section of the New Bedford Standard-Times in the late 1930s. "The scene is typical of Main Street, Anytown, but in this instance it happens to be Center Street, Middleboro, looking west", read the caption that accompanied the photo. Though "typical" the view may have been, it preserved for posterity a glimpse of the business section of Middleborough which was both unique and special to its residents. Proceeding westward along Center Street, the first building at the right is the Fish Building, constructed in 1934 by Robert and Alphonso D. Fish. For years it housed the Walk-Over Shoe store which had been established in the early 1930s. In 1934, proprietor Roger W. Kelley sold the business to Daniel Besse and Fred Lang. Walk-Over would operated for many years at Middleborough center and would later be known as Stile's. Woolworth’s first came to Middleborough in 1911, establishing a store in the American Building on South Main Street as Middleborough’s first chain department store. This building was built the same year that Woolworth’s principal Middleborough competitor W. T. Grant arrived in town. Woolworth’s initially took a 20 year lease on the building commencing May 1, 1928, occupying the southernmost store. In 1948, Woolworth’s expanded to occupy the entire building, but at the time of the photograph, the northern half of the building was occupied by the Park Café. The café’s owner, Nicklas Zervas, took a ten year lease on space in the building commencing April 1, 1928. His establishment occupied the northernmost of the two spaces. Next is the woodframe building once occupied by Sparrow Brothers men’s clothiers which operated for nearly 50 years from 1880 through 1929. 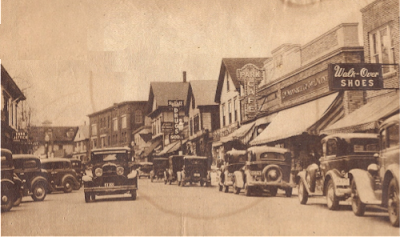 The Sparrows continued to own the building through 1945 during which time they rented it to various business concerns including the Economy Grocery Store and Town Cleansers. Beyond Sparrow Brothers is the drugstore of Jesse F. Morse, housed in the former William S. Pierce House. This building has the distinction of being the oldest extant structure on Center Street in downtown Middleborough, having been built about 1833. Originally occupied as a dwelling by Pierce, in 1875, the structure was converted to commercial use by druggists Shaw & Childs which operated in the building until 1906. This firm was succeeded by Jesse F. Morse who operated the drug store until his death in 1948. At the time the photograph was taken, M. L. Hinckley and Son operated a jewelry store in an ell to the rear of the building which is presently occupied by Hollyberries. Next to Morse’s and conspicuous by the “First National Market” sign extending from its façade is the Ryder Block. Built in 1927, the block was occupied immediately by stores housing a First National grocery market and a W. T. Grant store. The First National would remain in the block until 1941 when it had its own store building erected on the corner of Center and School Streets (now Benny’s). Grant’s would relocate to North Main Street in the 1950s. The Ryder Block would later be long occupied by The Boston Store. The large wood-frame building beyond the Ryder Block was occupied at the time of the photograph by Ryder’s Department Store (the store name can be made out on the side of the awning hanging from the front of the building). Constructed in 1883 and demolished in 1968, the building housed a succession of “dry goods” firms including Whitman’s, Ryder’s and MacNeil’s. The site is now occupied by a branch of Sovereign Bank. At the corner of Center and School Streets, a portion of the T. W. Pierce Hardware Store building can be glimpsed. Originally built as a shoe manufactory for Perkins, Leonard & Barrows in 1853, the building was occupied after 1872 by hardware dealers and tinsmiths Pierce & Paige. Following 1881, the business was operated exclusively by T. W. Pierce and remained in business until 1941. In 1940 the building was demolished to make way for a new First National. Across School Street, the Glidden Building is conspicuous, and has been a Center Street landmark since the late 19th century. Beyond it is the so-called Klar Building which was built in 1895 for bakers and confectioners Pasztor & Klar. In 1911, Pasztor & Klar erected a new fire-proof building of brick on the next lot north, and it is barely visible in the photograph. Later occupied by Shaw’s Furniture, this building was occupied by a wide variety of businesses over the years, including Pasztor & Klar (from 1911 until 1920), Gliddens, and the Middleboro Bowling Alleys. It is presently being rehabilitated for use as a local theatrical venue. The large building behind with the two visible dormers is the original School Street School dating from about 1850. At the time the present school building was constructed in 1907, the original school building was relocated to Center Street and converted to commercial use. Above the roofline of the school, just above the left-hand dormer, the roof of the Leonard & Barrows shoe manufactory tower is visible. At the left side of the photograph, a small portion of the Thatcher Block is visible. At the time the block was erected in 1877, the Old Colony Memorial reported: “A large two story block has been erected on the Thatcher estate on Center street, containing four roomy stores, a hall to be used by the Sons of Temperance, tailor shop, etc. This adds much to the appearance of the town.” Over the years, the block would be occupied by a variety of businesses. The building still stands, although the second floor, which once housed the local Y. M. C. A. has since been removed.